A C11 doorway from the nave is now reset in a C19 north aisle and some of the western chancel may also be C11. The south aisle is C13 and so, though rather later, is the detail of the western chancel. In the C14 the tall south chapel was added and the south aisle was extended to the west. 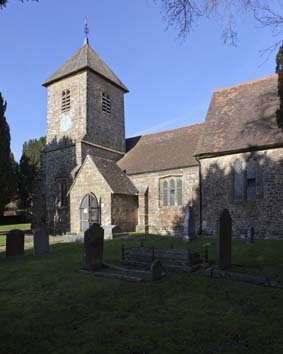 A south west tower was built c1500 and the chancel was lengthened in the C19. The village, approached down a small lane, consists of the church and a few houses and is some way from the station of the same name, which is not even in the parish. Ecclesiastically it was at first a chapelry of Ditchling and only separated completely after the Reformation (VCH 7 p123). 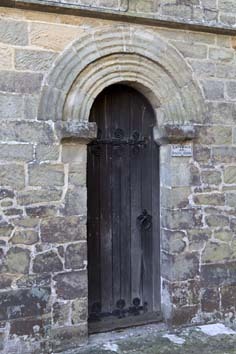 Only the north doorway, now reset in the C19 north aisle, shows that the nave was originally C11. It is related to those at Bolney and Stopham, both West Sussex, and like them is post-Conquest, with plain, square jambs and abaci (the latter chamfered on the underside) and two slightly stepped orders on the head, with shallow concentric bands, known as reeding. Two C19 drawings of the north side (Quartermain (E) p297 and by A N Somer of c1830 (ESRO Par 514/4/5)) show it in position, the latter with wider proportions than is actually the case, but no other early feature is visible. The early C13 south aisle, as built before it was later extended to the west, has a two-bay arcade with slightly chamfered arches and a squat round pier. In the late C13 the chancel was remodelled, though it was not then lengthened and some of the walling at least is probably older, quite possibly C11. Its east triplet is now set in the C19 north aisle (B 28 p351). One of the two north lancets shown on the drawings mentioned survives. It is contained in a recess, probably for a tomb, though its square head is a later alteration. The east wall of the C14 south chapel is level with the east wall of the chancel as it was until the C19. It is strikingly taller than either the nave or the chancel and gives the church a rather uneven silhouette. Small lancets in its end-walls are too insignificant to show the date, which is shown by the south window with two trefoiled lights. Under the east lancet inside is an altar-recess and there are retooled, chamfered arches; that into the chancel dies into the west respond, with a stop on the east one. The VCH (7 ibid) suggests the plain arch into the aisle is early C16, but it is more probably C14. 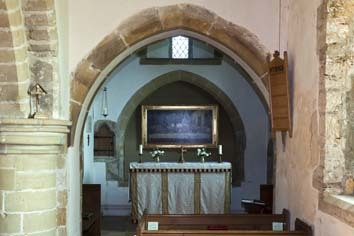 The chancel arch has the C14 device of two chamfered orders merging into the responds, but it was restored in the C19 after earlier alterations, possibly in the C17. Also in the C14, the nave and aisle were extended by a third bay to the west. The chamfers on the arch are broader and its west respond ends on a corbel, whilst the necessary new pier was adapted from the C13 west respond. It remains squat, though the mouldings on the abacus are more elaborate. 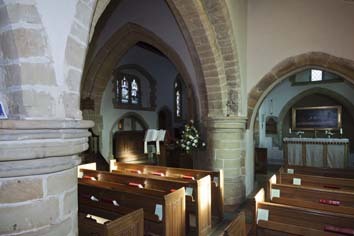 The C14 part of the aisle was altered when a tower was inserted about 1500, but the smaller stones and plinth of its west wall are both present in the west wall of the nave, showing that both walls are C14; the restored, traceried west window and hollow-chamfered doorway are consistent. The slight tower of c1500 has low buttresses and is divided by a string-course, with two-light square-headed bell-openings in the upper stage and an overhanging pyramid, now tiled. By this date broach or octagonal spires were more usual, but it is unchanged from the Burrell Collection drawing of 1787 and is thus probably original. Pevsner (BE p640) suggested that tiny openings above the string-course may have been taken from the C11 church, but they have ogee-heads, so if they are indeed reset, a C14 date is more likely. When the tower was inserted, the aisle was remodelled. Inside, the tower is supported on a double-chamfered arch across the aisle, which partly conceals the awkward C14 pier of the arcade. A two-light south window and a three-light one in the chapel have distinctive flattened heads and the one in the tower has weathered head-stops. Those at the ends of the square hood of the four-centred south doorway are grotesques, of which one is inverted, and there is foliage in the spandrels. Two lost north windows, one with mullions and one with sashes, could have been C17 or C18 and a dormer above the north doorway shows there was a gallery. A few rounded timbers in the nave roof may be of this period; otherwise, C19 boarding hides everything. At the restoration of 1869-70 W Slater and R H Carpenter (B 28 ibid), added a gabled north aisle with lancets, arranged symmetrically either side of the reset doorway. The arcade differs from the south one, with piers of quatrefoil section. A new south porch replaces a large one in the Burrell drawing and the chancel was lengthened with traceried windows. The Builder (ibid) noted approvingly that it now had ‘the proportion which it ought to have been in the fourteenth century’. The moving of the east triplet to the new aisle exemplifies the belief of the era that stylistic and liturgical appropriateness came ahead of authenticity. In 1937 Sir J N Comper, together with his son S Comper, undertook considerable work at the eastern end of the church (Mitchell/Shell Guide p189). 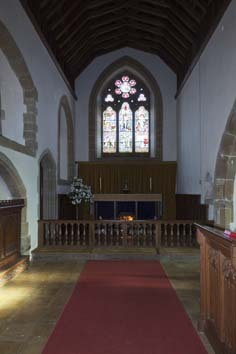 The most conspicuous feature was a new north vestry, but there were also new fittings in the chancel (see below) Also, the floor of this was returned to its former level A further extension at right-angles to the north side of the chancel was designed by J D Clarke and Partners in 1993. It is in a vernacular style that matches the rest of the church in its use of what is largely local stone. Altar rails: 1937 with arched tops between the balusters, by Sir J N Comper, if not S Comper. Aumbry: (South chapel) C14 trefoil-headed and linked to the adjacent altar-recess. Font: C19 with a round, moulded bowl. 1. (East window) D Bell, 1876 (www.stainedglassrecords.org retrieved on 29/3/2013). 2. 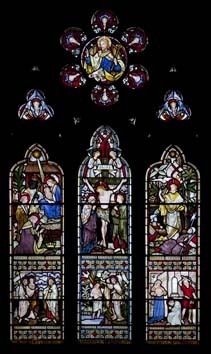 (North aisle, east window) J Powell and Sons, 1893, designed by G Hutchinson (Hadley list). 3. (West window) A K Nicholson, c1922 (DSGW 1930). 4. (North aisle west window and sixth window) A L Wilkinson, 1937-38 (DSGW 1939). 5. (North aisle, first window) F H Spear, St Francis, c1958 (WSRO Fac). 6. (North aisle, third window) J Gray, 1995 (signed). 7. (North aisle, fourth window) P Heskett, 1976 (www.stainedglassrecords.org retrieved on 29/3/2013). Mass dial: (Reset in a south east quoin of the chancel) It now faces east instead of south so it has been moved. 1. (In tower) John Richbell (d1697/98) and others of his family, consisting of two arched panels above a cherub’s head. It is attributed to W Palmer and dated to c1720 (BE(E) p681). 2. 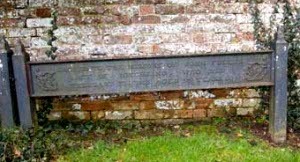 (Against the west wall of the churchyard) Two rail-tombs of iron, commemorating the deaths of husband and wife in 1807 and 1845. They probably both date from the later year. 3. (Churchyard) Gravestone with cross to Richard Tyrell (d1918 aged seven) by E Gill (E R Gill p51). 4. (Churchyard) Gravestone to Annie Trumble (d1917) by E Gill 1919 (ibid p52). Painting: (Altar recess of south chapel) Faint and now hard to decipher, this consists of diaperwork (2 p54) and is probably C14 like the rest of the chapel. 1. (South chancel) Plain and pointed C13, with a shelf. Its position well west of the present east wall shows where the altar stood before the C19. 2. (South chapel, south wall) C14 trefoil-headed with stops. Pulpit: Originally C17, the plain sides have pilasters. However, it is much altered, for the tester is now the base. 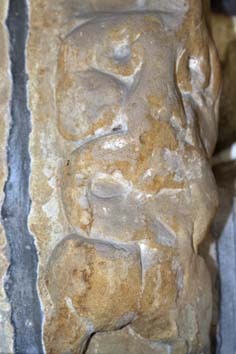 Stoup: (South porch) c 1500, damaged, with a four-centred head.